As we were sent a copy of Pop Reads to review, it inspired me to write this post about Audrey and Rex’s favourite books and songs (basically because I know I’ll forget and I want a record (no pun intended))! Pop Reads books are by a Brighton dad – licensing Sony/ATV music in children’s book form – they are the only books of their kind and they have a Kickstarter which you should check out here. We got “Perfect Day” and I have to be honest, the first time I sang it to Audrey, she got quite annoyed; “You can’t sing it!! You have to read it!” Ha ha. We had left the book on the coffee table and a friend read (sang) it to them whilst we were out; “That’s a surreal book isn’t it?” he commented when we got home. Apparently his singing was allowed… anyway after that Rex was singing “Perfect Day” and thrusting the book in my hand – a hit! Since then, I have tried reading the book to Audrey and she insists I sing it! Success! As singing and reading are two of our favourite pastimes, we think Pop Reads is a great idea – check out some of the other songs available; Can I Kick It?, ABC, Girls Just Wanna Have Fun, Race for the Prize and I Wish it Could be Christmas Everyday. Audrey and her Pop Reads book in our messy house. Audrey used to absolutely HATE this song and I really don’t know why. She would freak out if it came on the radio, saying “I don’t like it!”, but then one day, the lovely Singing Hands ladies did a Makaton signed version and whadayaknow? I now have to listen to this song at least three times a week. We were listening to tbe Baby Driver soundtrack and Audrey took to this straight away. Sometimes songs just reach into her soul and she loves them instantly. She would call this song “Lolly” (because of the yodeling), but soon got the real title thanks to our Google home thingy (“Hey Google! Play my Focus!”). This one is one of Rex’s favourites. We go to a weekly music group called Little Pickles, run by a guy called Dave, who peppers the standard ‘Wheels on the Bus’ moments with snippets of old and new pop songs. This one spoke to Rex and he likes to sing it and dance to it at least once a week. Again, one Rex fell in love with from Little Pickles, but one I think that stuck after some YouTubing with my mother-in-law. This was Ted’s entry to hip hop in 1990. So naturally he tried it out on Audrey and again, instant hit. She was OBSESSED by this one for a while, but it has died down recently due to Roar. Audrey really loves the Carpool Karaoke with Bruno Mars, but this song is s stand out classic that both kids love a boogie to. We were listening to a friend’s radio show (Tuckshop Community Radio) when this came on and both kids (Rex was about 1, Audrey almost 4) danced and danced. I stumbled across this in the Book Nook and instantly loved the illustration, partly because the feral little girl has an Audrey vibe. I had no hopes for the kids liking it as they are so unpredictable and make me read them lots of books I hate, but this one ‘spoke’ to them. They love her expressions – especially when she is angry and “enough was enough!”. This was a gift for Audrey ahead of school starting, but strangely it was Rex who became fixated on this one and chose it every bedtime for weeks. Another sneaky Book Nook find that I just loved for me. Turns out that the kids and I share the same taste quite often because they love it too. They particularly like shouting “Charge!” and they call this one “Oh woe!” because of the wolf’s cries. My favourite book as a child. I loved the pictures and still remember loving the bit where they go out in the dark to a cafe! Wow. The kids love this one too but I think mostly because the tiger is exciting, going out to cafes is pretty standard for them. Well, who am I kidding? They like tonnes of Julia’s books (Zog, Cave Baby, The Gruffalo…), but this one is my favourite. Audrey and I actually stumbled across this one in the library and it was her go-to bedtime story for a very long time. This one was my mother-in-law’s discovery and we love the grumpy panda and his rude friends. Audrey was going to a superhero-themed birthday when I discovered this book as a present and decided to get her a copy too. The characters have excellent names (Pat, Frida…) and when she’s older she will realise she is learning a lot about bats! An absolute classic with beautiful illustrations, try humming Toto’s ‘Africa’ during the wild rumpus (it works for our two)! Another lucky library find; this is a great bedtime book as it definitely gets us all yawning and feeling sleepy, it’s also a lot of fun. In truth, the book list could go on and on. They go through phases of choosing the same titles at bedtime over and over, but then a new favourite comes along… long may their love of books and music continue! Last week I had a rare full day alone with Audrey (as we are in the school holidays and Rex was at nursery). We went in the car to a lovely play park and cafe by the beach. We picked out our best pebbles and I told her how I used to go to the beach with my mummy and collect the best shells. Audrey has a wonderful way of interacting, she’s supportive and interested; “Oh wow, with your mummy? That’s great!”. We had a play in the park, we shared scrambled eggs and toast in the cafe. Audrey bossed me around a bit, she bossed around others too (telling a mum to “Calm down” when she was telling off her toddler! ), we got back in the car and headed to the supermarket. She flatly refused to get out of the car when we go there – told me she wanted to stay put. I tried to be as gently as possible in convincing her, but I was getting no where fast. I eventually had to man-handle her out and then distract her with news that the trolley had a ride-along buggy board! Fun! It worked. At home we were both tired and sat watching a film until I thought it best to head out again (or we’d easily watch TV all afternoon) and we walked to our local park. None of this is a big deal… but it was a big deal. For Audrey to walk to the park and back and not ask to be carried, for her to interact and play with other children once we got there, for her to stop sensibly to cross the road and hold my hand – things one might take for granted in a typical 5 year old – I do not take for granted. I revel. I praise. Oh wow… she is going to have such an inflated ego! Because none of this simple stuff was expected, because her default position is a condition that “limits”; I am constantly lifted and amazed by her. As we walked to the park, having a conversation, I thought back to the leaflet we were given when she was born. 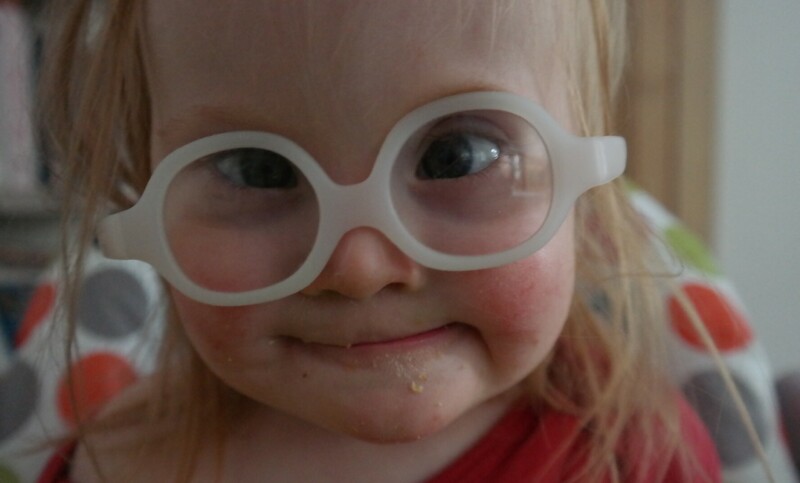 It’s intention is not negativity, it aims to give you a fair account of what to expect of a child with Down’s syndrome; but they have to cover everything. So the list goes on; language delay, possible hearing problems, possible sight problems, speech may be difficult to understand (if they master speech at all), a long list of health issues, challenging behaviour, the autism spectrum, food problems, thyroid issues…. it goes on and on. To be honest we hid the leaflet away and didn’t return to it. Sometimes something will get mentioned by a professional “Of course you are aware that children with Down’s syndrome can be prone to…” and I think “No, I wasn’t aware of that” and it doesn’t matter. I know that knowledge is power. I know it is good to be prepared. I also like that my child leads the way a bit. There was no leaflet with Rex; we just muddled our way through. I know that for some, that negative list in the leaflet is a reality and they aren’t walking to the park with their 5 year old with DS chatting about flowers and “Oh look that’s where I had my birthday party…”, I know we are so lucky. I feel lucky every time she calls me “Mummy”, every time she holds my hand, holds it to her face and then kisses it. Our life is not without stress – several bouts of diarrhea for the kids last week, the two of them fighting, stropping, running off, challenging me… but I want to remember all the good stuff. Actually, I want to focus on it! Because how else do I get through all the crazy days with these kids?! My magical, crazy and surprising kids, that have no guidebook. Back in 2014(!) I remember vividly that I was walking Audrey around in her buggy when I received a message from Jamie to see if I’d be interested in writing in a “physical diary” about Down’s syndrome – to put pen to paper and tell our story. I was very flattered and of course said yes straight away. I had found so much comfort from Instagram accounts and blogs that I found (relating to DS) in those early days. I was inspired to share our family life and so adding to a travelling diary seemed like a great idea. Jamie started the diary and began to send it around the world to gather family’s heartfelt stories, but I don’t think anyone could have know how long this might take or that so many people would want to be involved; she’d have to send off lots of other diaries to meet demand! Once the diary finally arrived my house (I was definitely feeling scared to have it) I thought I’d add my entry and pass it on to the final contributors. Simple. Maybe a week to turn it around? But, just like everyone else, it took me a while to get going with the writing. I needed to read the other entries. Then I needed some pictures of it with Audrey… but she wasn’t playing ball and oh how precious a real book of heartfelt stories is, I couldn’t let the kids have free-reign with it! Finally I put pen to paper and wrote my entry (slightly disappointed by my handwriting! ), but I must admit the words didn’t come as easily as I’d have liked. I felt a lot of pressure not to repeat what other families had written and also not to repeat things I have written in my blog over the years. I’m very proud to have taken part, added our entry and pictures of Audrey, but of course I feel like I could have done more. Poured my heart out more, stuck in the best photographs, said something deep. And I forgot to take pictures of my entry and/or type up my words, so I can’t even tell you exactly what I wrote! Oops. Oh well, it’s with the penultimate contributor now, before hopefully winging its way to a (famous) advocate to write the forward to what will hopefully be a published piece of work! One thing I do know, is that writing makes me happy. Advocating for Audrey and people like her makes me happy. As she begins her new journey from toddler life to schoolgirl (! ), I too shall be start my new journey to pursue my writing. To devote time and energy to it, but also have the flexibility needed to work around Audrey’s school life. So far (fingers crossed), Audrey loves school and is throwing herself into it all will full enthusiasm and making me proud like she always does. I’ve just dropped off a piece of me in a classroom with lots of people I don’t know. The little lady has started reception at primary school. My daughter is friendly, kind and gentle. She loves imaginative play and reading books. She likes routine. I have no doubt that she will enjoy school, I’m just not sure how much I’ll enjoy her being there! Anyone who knows me that I will cry at TV programmes, songs that come on the radio and a fleeting thought about someone’s sad situation, so it was a huge surprise that I didn’t cry today dropping Audrey off at her first day of school. Several factors helped – school drop off is not a romantic, sound-tracked moment. ; it’s carnage! We went as a family, with a child in a buggy and one on the loose, we battled through a crowd of legs and shouting and hugging and hellos and goodbyes to get to her class. Also, Audrey was very excited. She managed to (almost) walk all the way there (major achievement) and she jumped, sang and hugged her way down the road, she was genuinely happy to be going to school. It’s tricky to feel the true emotion of a momentous occasion when you are in it. It’s actually easier for me to be tearful anticipating it or reflecting on it. And so, here I am in a cafe. Ted and Rex are off shopping (typical boys!) and Audrey is in her school classroom, with her teachers. Of course I can’t help but reflect on 5 years with her. 10 months of maternity leave of just us, followed by a mix of us and nursery, us bump and nursery, us Rex and nursery… and now Audrey has her own thing, she is a schoolgirl! “They” say it goes in a blink of an eye. I don’t know if I feel quite like that, but I do feel immensely proud of Audrey and how far we have come from tiny baby on oxygen to confident 5 year old. As I analyse my feelings, I can see what is creeping in… I felt it during maternity leave with Rex. She had her nursery days and we went to groups but I was suddenly a different mum, I was seemingly a mum of one typical child but that was not my whole identity. She is a part of me, a part of me that I am truly proud of and it can feel very strange to be out and about without her. What a mix of emotions this brings and a new chapter for us all – I have handed in my notice at work and plan to work on freelance writing. I am very lucky to have a supportive husband allowing me to take this leap and it also means that I can be there to drop off and pick up Audrey from school. Happy September and good luck to everyone in their “firsts”, I love autumn and I’m feeling so very happy that its crisp and sunny outside and the leaves will soon be crunchy under our feet. My favourite time of year. On Wednesday night I woke around 1am to find myself being sick on and off through until 8am. It goes without saying that Thursday was not a great day for me. Thankfully Ted worked from home and my children offered me plastic cups of “medicine” and gave me hugs and kisses (that I should have fought off due to my potential contagiousness! ), they also whined a lot and ran around arguing. Being ill as a grown-up with kids is the worst. The best time to be ill is when you are a kid and a parent looks after you. Anyway, I felt a lot better on Friday and we had a good day with the kids (some top secret modelling, but will share more about that at some point! ), we took them to the park in the afternoon and met a lady with a 4 year old son who has special needs. We got chatting and we found ourselves in a position we’ve been in before – struggling to empathise with someone who thinks you can. She sees another “special needs family” and shares her story, but we feel, well, like we occupy a different space; Audrey isn’t “severely” special needs, but she’s not typical either. She sits in a space in between the two. I’m not denying Audrey has special needs, she definitely does and you only have to spend time with other 4-5 year olds to know that she is “different”. However we often find ourselves chatting to someone who is offloading about their child (with some form of special needs) constantly waking in the night, struggling to communicate, challenging behaviour, interacting with other children (hitting, tantrums)… for the most part I can only really apply some of these challenges to Rex! This lady said she was surprised we had chosen to have another child after our first had special needs! Ha! How we laughed about that one on the way home. All children are hard work and of course, children with special needs present a different set of challenges, but Audrey made us feel very comfortable about doing it all again. Rex, however, well and truly scuppered plans for any more kids! That evening I was very much looking forward to a decent sleep (as even Thursday night I was restless). As discussed with the lady in the park, Audrey is a good sleeper, but Rex sometimes shouts in his sleep. Around 2am the dreaded sound of Audrey retching reached my ears – I was out of bed like a shot. There she was, sat upright, sick in her bed and bright and chatty “Sorry Mummy” she said as I wiped up the sick. And after vomiting in the bucket I held for her, “Phew! That’s a lot of sick!” She said, brushing her hair back. She literally couldn’t get any better. After returning to bed and several more leaps back out to her aid with the bucket, I decided it would make more sense for Audrey and I to sleep in the spare bedroom together. So I scooped her up and laid next to her in the double bed, bucket at the ready. As soon as I laid in the dark with her, I felt around to find her face and gently stroke it. She did exactly the same and stroked my face. She whispered that we were in “Uncle Graeme’s bed” (because he stayed in our spare room for a week during his chemo this year). She has a snotty nose at the moment, so within minutes she was asleep but snoring like, well, like her Uncle Graeme. I realised that I was really going to struggle to sleep, but do you know what? I strangely didn’t care. I could smell her sicky breath, but I could also feel her warm body right next to me and I felt so lucky to be her mummy. To be her protector. In the morning I was awoken by many things (Audrey’s feet kicking me, the light coming through the half-closed blind, Rex thrashing about in his cot), but it was magical to wake to the sound of Rex saying “I want Audrey back!”. I arrived for the open evening at Audrey’s school on a sunny summer’s evening, listening to Desert Island Discs, feeling excited about my little girl’s future in mainstream school. I joined a queue to buy school uniform, chatted to some mums I had met before and gleaned information from these pros (with kids already attending the school) on what to expect. I sat down clutching the welcome pack with Audrey’s name and class on the front and by chance sat behind the mother of one of Audrey’s nursery friends – (I could see the name and class on her welcome pack) and I could see they were in the same class. Everything was falling into place. The teachers spoke at the front of the assembly hall and took us through the basics; uniform, PTA, after school club, forest school (so on trend). And then we all got up and filed into our specific classrooms to mingle and meet our child’s future teacher. For some strange reason, I was quite focused on meeting Audrey’s teacher, but the thought of her 1:1 had barely crossed my mind… at least I thought it hadn’t, but I realise now I had already pictured her – in her 20s, enthusiastic, dedicated to children with special needs, passionate about it, a Makaton pro, a bit quirky. So I guess it was a surprise to meet the lady who was older and not physically the picture I had in my head. And then, as surprisingly as she’d appeared; she made a bad impression. I asked about her experience and she told me how she had been working with a “Down’s boy” at the school and then she’d been at a special school a few miles away which had “loads of Down’s kids”. Outside I was smiling and nodding, inside I was crushed. How could this be someone passionate about people with Down’s syndrome? She doesn’t even know how to speak to me without offending me! She doesn’t understand person-first language. How can this person be the chosen 1:1 for Audrey? It made no sense. I was awkward and made some comments about regretting not preparing with questions and I moved to the queue to meet the teacher. The 1:1 popped up again, asking me about Makaton signing and why Audrey’s nursery had corrected her (she showed me the sign, I corrected her too). Such a minor “hiccup” you might think, but at this point I was getting anxious inside, imagining Audrey bonding with a woman who was seemingly getting everything wrong. The thing is, people get person-first language wrong all the time and most of the time it doesn’t bother me that much. I don’t like to be pedantic (ok, I kind of do) but hey, I was made that way… in the same way that a cafe might list “sandwich’s” for sale and I will despair (but not run in asking them to correct the laminated menu), I despair a little over someone saying “a Down’s kid” but rarely take the time to correct them. However. This was meeting a professional in a school. Someone who has clearly worked with children with Down’s syndrome for years and someone who has been employed to spend a lot of time with my daughter. So in this scenario, I should have said something, but because awkward conversations are not my thing, I ranted at other mums, had a rough night’s sleep, ranted a bit more to friends the next day and finally sent an email to the Head of Inclusion at the school to explain what happened. What really gave me the confidence to write to the school, was the support I had from mum friends (those with typical children), who agreed this language was not on. They made me feel like I wasn’t over reacting. This all happened last week and having had some time to calm myself and reflect, I had a meeting at the school this morning and I’m pleased to say I feel reassured that this was an unfortunate mistake and that they (the school) are more than versed in the correct language and will be ensuring all the teaching assistant are reminded of the correct terminology. It was also helpful to hear that the 1:1 had come to the open evening off her own back because was excited to meet me, because she is excited to be Audrey’s teaching assistant. I can step back now and know that she does care, she will learn from this and that this bad experience can help the school, parents and teaching assistants learn something moving forward. In fact I’m already discussing with another mum from the T21 crew (who was my immediate “What would she have done?” thought when I was faced with the dodgy language) a way of using this experience to create a “going to school pack” that can help schools and families learn from this dodgy experience. Hopefully no one is reading this wondering what all the fuss is about, but if you are, then please just know that words are important. Audrey is so very precious to me and I want her to have the best start at school as she can possibly have and this begins and ends with her being treated as an individual. Our little Audrey starts school in September. She “should have” (under the usual system) started in September 2017, but, thanks to a change in the rules, we were able to defer her for a year so that she enters reception as the oldest, rather than one of the youngest. We have chosen a school near us, which is mainstream (for typical children) and happens to be a church school. Children with an Education, Health and Care Plan (that’s our Audrey) are allocated a place first. They the go through various other criteria (living in the catchment, worshipping at the church, having a sibling at the school etc). Despite Audrey being at the top of the list as it were, I was a little nervous (and I guess confused) by the system. I waited like everyone else for my email confirmation that Audrey had her place at our chosen school, (despite the fact I had already been in a meeting with a member of staff from our chosen school, discussing Audrey’s future there as if it were a given). But on school admissions email day… Nothing came. Instead, on the day people were notified what school their child was allocated, I was copied in on an email from the local authority to the Head of Inclusion at the school, basically saying “please let us know if you cannot meet Audrey’s needs”. This did not make me feel secure. Especially when the response was that they would “make a decision after visiting her at nursery”. So we had gone from top of the list to a decision being made after the announcement day for everyone else! I am pleased to say that a week later than everyone else, I received an email that confirmed they will be accepting Audrey at their school in September. Phew. I’m also pleased to say that when I dropped off the required paperwork for Audrey’s application, the lady on the school reception said they had no other Audreys. And I just know that everyone will know her at this school. That feeling of pride that I regularly get from seeing her chat away to new people – I shall experience that en masse as she settles into the school routine. I also went to a “transitioning to school” coffee morning last month, for parents of children with special needs. It was another eye-opening discussion where I realise that many children have more complex needs than Audrey, although I also felt very aware that she does have special needs. She will love school, but will find some of it challenging. However, (as cheesy as this is), the headline motto from this meeting was that there is not need for your child to be “school ready”, rather that the “school needs to be ready for your child”. And despite Audrey not currently being potty trained (something I had hoped/expected us to have nailed before school), I feel confident that she is ready and that the school is ready for her. Putting aside the unbelievable gaping hole she will leave behind in my weekday life, I’m excited for this new chapter in her life.